UNMC researchers have built on Nobel Prize-winning research to devise a new way to create powerful stem cells that could cure several conditions that cause blindness. 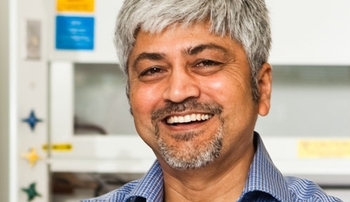 A team led by Iqbal Ahmad, Ph.D., professor of ophthalmology and visual sciences, can now turn adult limbal stem cells from the cornea into cells similar to powerfully-regenerative embryonic stem cells in animal models. These new cells can generate retinal progenitor cells that could potentially cure conditions such as glaucoma and age-related macular degeneration. The work builds off that of Drs. John B. Gurdon and Shinya Yamanaka, who won this year's Nobel Prize in science after they genetically altered adult stem cells into induced pluripotent stem cells (iPSC) -- which mirror the qualities of embryonic stem cells. "Whenever a breakthrough such as that is made, it becomes a rung on the ladder that leads to further development," Dr. Ahmad said. Rather than use genetic manipulation, Dr. Ahmad's team soaks the adult limbal stem cells in an enhanced tissue culture. The soak in the solution changes the molecular make-up of the limbal cells so they become iPSCs. Dr. Ahmad's team has transplanted its new IPSCs into the retinas of mice with experimental glaucoma. Early tests show that the cells have started to transform into retinal cells that degenerate in glaucoma. They have shown that these newly generated retinal cells make the neural connections needed to restore sight. Further tests will show if sight is restored, Dr. Ahmad said, but the work has shown enough promise to secure a $1.48 million, four-year R01 grant from the National Institutes of Health. The newly created retinal cells also can be studied to see what genes are responsible for sight degeneration and what genes fight vision loss. This could lead to drugs that block the degenerative genes or bolster the genes that fight vision loss, Dr. Ahmad said. "We've shown that changing the environment around these adult stem cells can change the cells themselves," Dr. Ahmad said. "We now seek more efficient ways to create these transformative environments to cultivate these powerful cells that may offer hope to so many." Dr. Ahmad noted that support from the Nebraska Department of Health and Human Services (NDHHS) for his team’s "Adult Stem Cells for Autologous Cell Therapy" project allowed the group to generate preliminary data that led to the NIH grant. “We owe our thanks to the state's support,” Dr. Ahmad said.